DNA methylation in mammalian genomes takes place mostly at CpG-dinucleotides producing 5-methylcytosine (M) in both DNA strands. In many cases regulatory regions (promoter and first exon) of mammalian genes include DNA sequences with high G+C content which are called CpG islands (Antequera, 2003). Methylation of these islands in the regulatory regions suppresses transcription, so this is a mechanism of epigenetic regulation of gene activity. Normally, DNA of each tissue may be characterized by the unique set of active genes, whereas other genes are inactive due to methylation of their regulatory regions. A change of gene methylation status in tissue may cause abnormal functioning of this gene, which in turn may lead to illness, such as a cancer (Bird, 2002). It is well known that at early stage of cancer the methylation of regulatory regions takes place in some genes which are active in normal tissue (de Caseres et al., 2007). Such abberant methylation was shown for a number of tumor suppressor genes in tumor tissues and this methylation status preserves in malignant cell lines obtained from these tissues (Kiseleva and Lihtenshtein, 2004; de Caseres et al., 2007). Aberrant methylation was described for several dozens of tumor suppressor genes and a set of modified genes varies in different tumors and malignant cell lines (Mishra et al., 2010). De novo DNA methylation in mammals is performed by Dnmt3a and Dnmt3b DNA methyltransferases, which recognize a tetranucleotide 5’-RCGY-3’ and modify an inner CG-dinucleotide with formation 5’-RMGY-3’/3’-YGMR-5’ (Handa et al., 2005). A direct determination of the DNA sequence in methylated regulatory regions of some tumor suppressor genes has revealed a presence of the consensus sequence 5’-RMGC-3’/3’-YGMG-5’ (Kim et al., 2008), which corresponds to the product of DNA modification with Dnmt3a and Dnmt3b. Recently we have developed a method of GlaI- and BlsI-PCR assays which allows determining the presence of 5’-RMGY-3’ and 5’-RMGYNRMGY-3’ sites, respectively, in a studied DNA region (Gonchar et al., 2010). The method includes DNA hydrolysis with methyl-directed DNA endonucleases GlaI or BlsI, followed by PCR with primers designed for the DNA region of interest. We have used this method to determine methylated sites in the regulatory regions of the tumor suppressor genes DAPK, RASSF1A and RARB (Gonchar et al., 2010). Here, we have applied GlaI- and BlsI-PCR assays to determine the presence of 5’-RMGY-3’ and 5’-RMGYNRMGY-3’ sites, respectively, in promoter and first exon regions of SEPT9b, IGFBP3, CEBPD and MGMT tumor suppressor genes in DNA preparations from well studied human malignant cell lines HeLa, Raji, U-937, Jurkat and control fibroblast cell line L-68. We have also performed more detailed study of RASSF1A gene regulatory region methylation in the mentioned cell lines. GlaI- and BlsI-PCR assays have shown that the studied regulatory regions of RASSF1A, SEPT9b, IGFBP3, CEBPD and MGMT tumor supressor genes either have or have no 5’-RMGY-3’ sites depending on malignant cell line which was used for DNA isolation. Different combinations of tumor supressor genes with methylated sites were observed in the studied cell lines. None of the mentioned regulatory regions contain 5’-RMGY-3’ sites in the non-tumor fibroblast cell line L-68. The obtained results show that determination of methylation status of tumor supressor gene regulatory regions using GlaI- and BlsI-PCR assays gives an opportunity for both determination and differentiation of malignant cell lines. Thus, GlaI- and BlsI-PCR assays may be applied for epigenetic typing of human malignant cell lines. Studied DNA regions of human genome. Five DNA regions have been chosen for this study: a promoter region of CEBPD (CCAAT/enhancer binding protein, delta); a promoter and first exon region of RASSF1A (Ras association domain family 1A); a promoter and first exon region of SEPT9b (septin 9b); a promoter and first exon region of MGMT (O6-methylguanine DNA methyltransferase); a promoter and first exon region of IGFBP3 (insulin-like growth factor binding protein 3). Genomic DNA digestion. DNA preparations from five human cell lines: L-68 (control, lung fibroblast), HeLa (cervix adenocarcinoma), Raji (Burkitt’s lymphoma), U-937 (histiocytic lymphoma) and Jurkat (acute T-cell leukemia) have been used as templates for PCR. Genomic DNA from human cell lines; restriction endonucleases HaeIII, TaqI, Tru9I; methyl-specific endonucleases BlsI and GlaI; HotStart Taq DNA polymerase were supplied by SibEnzyme Ltd. (Russia). DNA from Drosophila melanogaster was kindly provided by Dr. L.P. Zakharenko. 5 μg of each genomic DNA was hydrolyzed with 50 units of TaqI or Tru9I in 50 μl of reaction mixture containing 1 x SE-buffer at 65°C for 2 hours (preliminary treatment). Phenol extraction and purification of digested DNA was carried out as described (Sambrook et al., 2001). 0.1 μg of each pretreated DNA was incubated in 20 μl of reaction mixture containing 100 units of HaeIII, or 16 units of BlsI, or 16 units of GlaI and 1 x SE-buffer recommended by the manufacturer at 37 °C (HaeIII) or 30 °C (BlsI and GlaI) for 2 hours. After incubation, the enzymes were inactivated by heat (80 °C in case of HaeIII, 65 °C in cases of BlsI and GlaI) for 20 min. 1 μl of reaction mixture (5 ng of DNA) was used in PCR reaction without phenol extraction. PCR technique. PCR was performed with GC-PCR kit (SibEnzyme cat. number K007) and HotStart Taq DNA polymerase (1 unit per 25 μl of reaction mixture) (SibEnzyme cat. number E351) in 25 μl of reaction mixture in thermocycler "Tercyk" (DNA Technologies, Russia). Table 1 lists the primers used in this study. Detailed PCR conditions are given in Table 2. PCR products were analyzed by 1.2% agarose gel electrophoresis in TAE buffer. After electrophoresis DNA bands were stained with ethidium bromide and photographed in UV light. 100 bp DNA ladder (SibEnzyme Ltd., Russia) was used as a marker of DNA fragment lengths. Analysis of DNA methylation. In this work we have studied methylation of CpG islands in regulatory regions of several human tumor suppressor genes - CEBPD, RASSF1A, SEPT9b, MGMT and IGFBP3A, by BlsI- and GlaI-PCR assays. The location of these genes in the human genome (according to GRCh37.p2 primary reference assembly) is given in Table 3. The structure of the regulatory region of all studied tumor suppressor genes is presented in Figure 1. According to Figure 1 and Table 3 a number of 5’-RCGY-3’ and 5’-RCGYNRCGY-3’ sites significantly differ in selected DNA fragments. We have determined methylated 5’-RMGY-3’ and 5’-RMGYNRMGY-3’ sites in the regulatory regions of tumor supressor genes in DNA preparations from five cell lines: four well-known malignant cell lines (HeLa, Jurkat, Raji, U-937) and the fifth one is DNA from the fibroblast cell line L-68, which is used as a control. Initially, all DNA preparations have been pretreated with a restriction endonuclease which does not have recognition sites in the selected fragments of the regulatory regions (Tru9I in the cases of SEPT9b and IGFBP3; TaqI in the other cases), in accordance with a pretreatment procedure used in bisulphite genomic sequencing (Clark et al., 1994). Figure 1. Scheme of the regulatory region of CEBPD, RASSF1A, SEPT9b, MGMT and IGFBP3 genes. 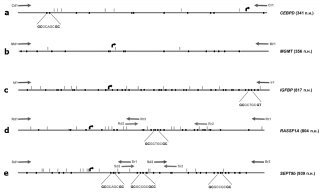 Recognition sites of the restriction endonuclease HaeIII are indicated by vertical bars. 5’-RCGY-3’ sites are indicated by circles. The DNA sequences comprising of two 5’-RCGY-3’ sites separated by one nucleotide (forming BlsI recognition site if methylated) are given below. Transcription start is indicated by a bended arrow. The size of DNA fragment is given at right of each scheme. Primers locations are given by arrows. 3) BlsI (recognizes 5’-RYNRY, if there is 5-methycytosine in each DNA strand of the site); BlsI hydrolyzes DNA sequence 5’-RMGYNRMGY-3’/3’-YGMRNYGMG-5’ consisting of two sites 5’-RMGY-3’ separated by one nucleotide (BlsI site is underlined). 4) no added enzyme, negative control. After incubation, DNA from four reaction mixtures was used as DNA templates for PCR. Analysis of PCR products has been done by electrophoresis instead of real time PCR because of relatively long DNA fragments studied in the work (341 bp, 678 bp and three fragments more than 800 bp). DNA from Drosophila melanogaster at the same concentration has been used as a negative PCR control. Figure 2 shows the data obtained for a study of five selected regulatory regions. Figure 2. BlsI- and GlaI-PCR assay of the selected regions. Pretreated DNA from L-68 (2-5), HeLa (6-9), Raji (10-13), U-937 (16-19), Jurkat (20-23); DNA from Drosophila melanogaster (14 and 24); HaeIII (2, 6, 10, 16, 20); GlaI (3, 7, 11, 17, 21); BlsI (4, 8, 12, 18, 22); no added enzyme (5, 9, 13, 19, 23); 100 bp DNA Ladder (1, 15, 25). The primers used for PCR amplification (see Figure 1) and the lengths of the whole regions are shown at right. CEBPD. Figure 2a shows data on GlaI- and BlsI-PCR assays of CEBPD promoter region. PCR product, 341 bp DNA fragment, is present in positive control (lanes 5, 9, 13, 19 and 23) whereas it is absent after hydrolysis of DNA from Raji and U-937 cells with GlaI and BlsI (lanes 11, 12, 17 and 18). There is only one site 5’-RCGYNRCGY-3’ in the studied DNA fragment, which may be cleaved with BlsI if methylated (5’-GCGCAGCGC-3’, Fig. 1a). According to BlsI-PCR assay results, this sequence remains non-methylated in DNA from L-68, HeLa and Jurkat but it converts to completely methylated sequence 5’-GMGCAGMGC-3’/3’-CGMGTCGMG-5’ in Raji and U-937 cells. Thus, according to GlaI- and BlsI-PCR assays data, at least two methylated sites 5’-RMGY-3’ are present in the CpG island of CEBPD promoter region in DNA from Raji and U-937 cells, whereas the studied 341 bp DNA fragment from control cell line L-68 and malignant cell lines HeLa and Jurkat does not contain methylated 5’-RMGY-3’ sites. The obtained data may be regarded as evidence of CEBPD activity in control cell line L-68 and malignant cell lines HeLa and Jurkat, whereas it is probably inactive in Raji and U-937 cells due to presence of methylated 5’-RMGY-3’ sites in the promoter region. As it was reported earlier, an absence of CEBPD protein in cells causes genomic instability (including chromosomal rearrangements) followed by a loss of normal growth control (Huang et al., 2004). Interestingly, such chromosomal rearrangements have been observed both in Raji (Karpova et al., 2005) and U-937 (Strefford et al., 2001) cells. Thus, our results confirm a possible relation between CEBPD gene silencing and some leukemia diseases. MGMT. Figure 2b demonstrates results of GlaI- and BlsI-PCR assays of promoter / first exon region of MGMT tumor supressor gene. GlaI-PCR assay leads to 356 bp PCR product formation in all cases excepting DNA preparation from U-937 cells (lane 17). So, CpG island in the regulatory region of MGMT gene contains at least one 5’-RMGY-3’ site in U-937 cells, whereas this DNA fragment in other malignant cell lines and control L-68 cell line do not contain 5’-RMGY-3’ sites. The BlsI-PCR assays show negative results for DNAs from all other malignant cell lines and this is probably due to absence of 5’-RCGYNRCGY-3’ sites in the studied DNA region. MGMT gene expression has been previously studied in U-937, Jurkat, Raji and some other cell lines. No MGMT activity was found in U-937 cells whereas rather high MGMT activity was found in Jurkat and Raji cells (Horton et al., 2009). Our results correspond to these literature data. IGFBP3. Figure 2c presents the results of GlaI- and BlsI-assays of the IGFBP3 regulatory region. A predicted 817 bp fragment is produced in both assays of DNA from control L-68 and malignant HeLa cells (lanes 3-4 and 7-8), whereas this band is not observed in PCR assays of DNA preparations from other malignant cells. The analysed DNA fragment (817 bp in length) contains only one 5’-RCGYNRCGY-3’ site, which may be cleaved with BlsI if methylated (5’-GCGCTGCGT-3’, Fig. 1c). According to the obtained results, 5’-GCGCTGCGT-3’ site remains non-methylated in L-68 and HeLa DNAs only and becomes methylated (5’-GMGCTGMGT-3’/3’-CGMGACGMA-5’) in Jurkat, Raji and U-937 cells. So, according to the results of GlaI- and BlsI-PCR assays, there are at least two methylated sites 5’-RMGY-3’ in the regulatory region of IGFBP3 gene in DNAs from Jurkat, Raji and U-937 cell lines, whereas DNA preparations from control L-68 cell line and malignant HeLa cell line do not contain methylated 5’-RMGY-3’ sites in the studied promoter / first exon region. Previously it has been shown that IGFBP3 protein level may decrease during the progression of some oncological diseases including prostate cancer (Miyake et al., 2000), ovarian endometrioid carcinoma (Torng et al., 2009) and colorectal cancer (Kawasaki et al., 2007). Our data indicate that IGFBP3 regulatory region methylation followed by putative decrease of IGFBP3 protein level also takes place in leukemia diseases, though inactivation of this gene is not observed in cervix adenocarcinoma (HeLa). RASSF1A. Previously, we have used GlaI- and BlsI-PCR assays to study the 804 bp DNA fragment which includes CpG island of RASSF1A regulatory region. It have been shown that this region contains 5’-RMGY-3’ sites in Raji and Jurkat cell lines only (Gonchar et al., 2010). In Figure 2d we have provided a detailed study of methylated sites 5’-RMGY-3’ distribution in RASSF1A regulatory region. Besides the whole DNA fragment (804 bp in length) we have analysed promoter region of RASSF1A gene (DNA fragment 385 bp in length) and a part of the first exon (DNA fragment 266 bp in length) which includes 5’-GCGCTGCGC-3’ site (Fig. 1d). Figure 2d presents results of GlaI- and BlsI-PCR assays of three mentioned DNA fragments. PCR products of the predicted lengths are seen in the assays of all three fragments in the cases of DNA preparations from control cell line as well as HeLa and U-937 cells (Fig. 2d, lanes 3-4, 7-8, 17-18). PCR products after amplification of 804 bp and 266 bp are absent in the case of Raji and Jurkat cells (lanes 11-12, 21-22), due to methylation of the mentioned 5’-GCGCTGCGC-3’ site which is converted to 5’-GMGCTGMGC-3’/3’CGMGACGMG-5’ site, cleaved with BlsI (Gonchar et al., 2010). The results of GlaI-PCR assay of 385 bp DNA fragment are not so clear. BlsI-PCR assay of this fragment gives negative result for all DNA preparations (row 2, lanes 4, 8, 12, 18, 22). Probably this is caused by the absence of 5’-RCGYNRCGY-3’ sites within this region. At the same time GlaI-PCR assay has shown that some methylated 5’-RMGY-3’ sites are present in this fragment in Raji and Jurkat cells only (row 2, lanes 11 and 21). This corresponds to results of assay for 804 bp and 266 bp fragments. However, it should be notified that 804 bp and 266 bp fragments are completely absent in Gla-PCR assay of DNA from Raji and Jurkat cells, while 385 bp fragment is amplified in low extent in comparison with control (lanes 13 and 23). Methylation of the RASSF1A promoter and first exon regions has been studied previously (Hesson et al., 2007; Feng et al., 2008; Peters et al., 2007). A detailed study of the RASSF1A promoter and first exon regions methylation in DNA from breast cancer cell lines was undertaken previously (Yan et al., 2003). The authors found weaker methylation of the promoter region than the first exon one and observed significant methylation of DNA in a region, that is close to the DNA sequence 5’-GCGCTGCGC-3’. Our results correspond to these published data. SEPT9b. The regulatory region of the SEPT9b gene includes three 5’-RCGYNRCGY-3’ sites, which are located downstream of the start of transcription (Fig. 1e) and may be cleaved with BlsI after methylation. We have carried out GlaI- and BlsI-PCR assays of three DNA regions, each of which contains one 5’-RCGYNRCGY-3’ site, separately. This allows to determine methylation status of the three overlapping fragments (432, 197 and 399 bp in length) in the whole promoter / first exon region. Data provided in Figure 2e show the same picture of all three DNA fragments methylation for each cell line. The amplified DNA fragments of the predicted lengths were observed in cases of control fibroblast and Jurkat cells only (Fig. 2, rows 1-3, lanes 21-22). The obtained results demonstrate that the 5’-RMGYNRMGY-3’ site is present in each studied region in DNA from HeLa, Raji and U-937 cells, whereas these sites are not methylated in L-68 and Jurkat cells. Aberrant methylation of SEPT9b has been reported in colorectal cancer patients only (Grutzmann et al., 2008). Our results indicate that this abnormal methylation of the SEPT9b gene may be detected in other malignant cells as well. Determination of methylation status of tumor supressor gene regulatory region using GlaI- and BlsI-PCR assays. DNA methylation of the regulatory regions of tumor supressor genes is the main reason of their inactivation (Jones and Baylin, 2002) and may be observed even at early stage of cancer (de Caseres et al., 2007). So, methylation status determination for these DNA regions is an important task for early diagnostics of oncological diseases. Currently, a method of sodium bisulphite conversion of DNA is the main method for direct determination of 5-methylcytosines in the DNA region of interest (Grigg, 1996). However, this method has a number of restrictions and is not used routinely in clinical practice. In this work we have applied the previously developed method of GlaI- and BlsI-PCR assays (Gonchar et al., 2010) for detection of 5’-RMGY-3’ and 5’-RMGYNRMGY-3’ sites in the regulatory regions of CEBPD, RASSF1A, SEPT9b, MGMT and IGFBP3 tumor supressor genes. The results of GlaI- and BlsI-PCR assays have shown a good correlation with published data on analysis of regulatory regions of tumor supressor genes obtained using the method of bisulphite conversion of DNA. GlaI- and BlsI-PCR assays are simple to use and allows to obtain unambiguous result (the presence or absence of methylated 5’-RMGY-3’ sites) in the most cases. BlsI-PCR assay has shown either presence or absence of 5’-RMGYNRMGY-3’ sites in the studied DNA fragments depending on the analyzed cell line. This allows to use GlaI- and BlsI-PCR assays as a simple and reliable method for determination of methylation status of regulatory regions of tumor suppressor genes. Distribution of 5'-RMGY-3' sites in the regulatory regions. Previously, we applied GlaI-PCR assays to determine DNA methylation of the RARB regulatory region in malignant HeLa, Jurkat, Raji, U-937 cell lines and L-68 control cells (Gonchar et al., 2010). 5’-RMGY-3’ sites have been observed in the studied DNA region in all tumor cell lines but not in DNA from control fibroblast cells. BlsI-PCR assay of the DAPK1 regulatory region revealed the presence of the methylated sequence 5’-GMGCCGMGC-3’/3’-CGMGGCGMG-5’ in DNA from Raji cells only (Gonchar et al., 2010). The data obtained in this work and previously published data (Gonchar et al., 2010) are presented in Table 4. This table includes the results of methylation status determination for regulatory regions of RARB, DAPK1, CEBPD, RASSF1A, SEPT9b, MGMT and IGFBP3 tumor supressor genes using GlaI- and BlsI-PCR assays. According to the table GlaI- and BlsI-PCR assays have revealed different combinations of the regulatory regions with methylated 5’-RMGY-3’ sites in DNA from all five human cell lines. BlsI-PCR assay gives the negative result in study of RARB and MGMT genes probably due to absence of 5’-RCGYNRCGY-3’ sites in the regulatory regions of these genes. At the same time Gla-PCR assay allows to reveal a difference in the methylation status of RARB and MGMT genes. In case of RARB gene 5’-RMGY-3’ sites are detected in regulatory regions of all malignant cell lines, CpG island of MGMT gene carries 5’-RMGY-3’ sites in U-937 cells only (Table 4). Both GlaI-PCR assays and BlsI-PCR assays produced the same results in the methylation study of each regulatory regions in the cases of CEBPD, IGFBP3, SEPT9b and RASSF1A, except a promoter region of the last gene. However, DNA preparations from all studied cell lines display different combinations of methylated regulation regions: CEBPD promoter region is methylated in Raji and U-937 cells only; RASSF1A promoter and first exon region is methylated in Raji and Jurkat cells only; SEPT9b promoter and first exon region is methylated in U-937, Raji and HeLa cells; the IGFBP3 promoter and first exon region is methylated in U-937, Raji and Jurkat cells. Gla-PCR assay of the RASSF1A promoter region (385 bp fragment) in DNA from Raji and Jurkat cells has shown a presence of 5’-RMGY-3’ sites only in a part of DNA molecules. This differs from a result of the RASSF1A first exon study by Gla-PCR assay, which has not revealed unmethylated 804 and 266 bp fragments. We can speculate that a promoter region of RASSF1A in Raji and Jurkat cells carries 5’-RMGY-3’ sites in one allele only, whereas a first exon of this gene carries two 5’-RMGY-3’ sites in DNA sequence 5’-GMGCTGMGC-3’ in the both alleles of diploid chromosome set of cells. The future work on Gla-PCR assay of this DNA region in a real time mode will verify this assumption. Analysis of DNA structure in the regions with BlsI sites. BlsI-PCR assay of regulatory regions of tumor supressor genes has demonstrated that each of seven 5’-RCGYNRCGY-3' sites in the studied DNA fragments (Fig. 1 and DAPK1 regulatory region in Gonchar et al., 2010) is methylated at least in one malignant cell line. In case of IGFBP3 and SEPT9b CpG islands these sites are methylated in three cell lines (excepting HeLa and Jurkat, respectively). In CEBPD and RASSF1A regulation regions these sites are modified in two cell lines (Raji, U-937 and Raji, Jurkat, respectively). Site 5’-GCGCCGCGC-3’ in CpG island of DAPK1 gene is methylated in Raji cells only. So, 5’-RCGYNRCGY-3’ sites in the regulatory regions of tumor supressor genes are methylated in different combinations depending on cell line, from which DNA was isolated, however each of sites is methylated at least in one cell line. Figure 3 shows nucleotide sequences of seven DNA fragments with 5’-RCGYNRCGY-3’ site. Comparative analysis of DNA structure does not reveal any similarity of sites' vicinities in all fragments. Nevertheless, it should be noted that each DNA fragment includes direct repeats surrounding 5’-RCGYNRCGY-3’ site. These repeats consist of 5 or 6 nucleotides, which are located at different distances from 5’-RCGYNRCGY-3’ site and include mainly G and C nucleotides. Figure 3. Primary structure of short DNA fragments with 5’-RCGYNRCGY-3' sites (shown in grey). Direct repeats are underlined. Typing of cancer cell lines. A set of methylated 5’-RMGYNRMGY-3’ sites in regulatory regions of DAPK1, CEBPD, IGFBP3, RASSF1A and SEPT9b tumor suppressor genes varies in the studied malignant cell lines. It allows to consider a characterization of cancer cell lines based on results of Gla- or BlsI-PCR assay of the selected DNA regions. Such Gla- or BlsI-PCR assay results in either an absence or presence of PCR product and gives an unambiguous conclusion. Authentication of cell lines is a very important problem in modern biology. It is well-known that many cell lines maintained in laboratories are incorrectly identified or contaminated (Stacey, 2000; Nardone, 2007; Capes-Davis et al., 2010). Many methods, such as isoenzyme analysis, karyotyping, single nucleotide polymorphism (SNP) and amplified fragment length polymorphisms (AFLP) are used for cell culture authentication. Recently short tandem repeat (STR) profiling has been chosen as a standard method for cell line characterization and confirmation of its purity (Alston-Roberts et al., 2010; Barallon et al., 2010). The cytogenetical and biochemical methods of identification (morphological observations, karyotyping and isoenzyme polymorphisms profiling) require rather serious differences in cell properties and morphology. These methods often are not reliable enough and are not convenient as routine laboratory procedure. Modern molecular approaches based on DNA variation are more accurate and a growing progress in standardization of some of these methods may be of great importance for cell biology and oncology. However, none of the mentioned methods takes into account an epigenetic issue for differentiation of cell lines, which is especially important for cancer cell lines. It is well-known that the methylation status of certain DNA regions is a serious sign of cell malignancy and differences in CpG island methylation has been observed for many cancer cell lines (Issa, 2004). So, determination of methylation status of regulatory regions of tumor suppressor genes is an important criterion for cancer cell line identification and differentiation. In this paper we have shown that combination of methylation status of seven regulatory regions of tumor suppressor genes differs for each of the studied malignant cell line (Table 4). Thus, BlsI- and GlaI-PCR assays of regulatory regions of tumor suppressor genes may be used for a rapid epigenetic characterization of cancer cell lines. GlaI- and BlsI-PCR assays have been applied to determine the DNA methylation status of the regulatory regions of SEPT9b, IGFBP3, CEBPD, MGMT and RASSF1A human tumor suppressor genes. The methylation status has been determined by the presence of methylated 5’-RMGY-3’ sites. Each of the studied malignant cell lines (HeLa, Raji, U-937 and Jurkat) differs from others in combination of regulatory regions with methylated 5’-RMGY-3’ sites. DNA from the control fibroblast cell line L-68 does not contain 5’-RMGY-3’ sites in any mentioned regulatory region. the IGFBP3 promoter and first exon region showed DNA methylation in U-937, Raji and Jurkat cells. GlaI-PCR assay of the MGMT promoter and first exon region demonstrated DNA methylation in U-937 cells only. Alston-Roberts, C., Barallon, R., Bauer, S. R., Butler, J., Capes-Davis, A., Dirks, W. G., Elmore, E., Furtado, M., Kerrigan, L., Kline, M. C., Kohara, A., Los, G. V., MacLeod, R. A., Masters, J. R., Nardone, M., Nardone, R. M., Nims, R. W., Price, P. J., Reid, Y. A., Shewale, J., Steuer, A. F., Storts, D. R., Sykes, G., Taraporewala, Z., and Thomson, J. (2010). Cell line misidentification: the beginning of the end. Nat. Rev. Cancer 10, 441-448. Antequera, F. (2003). Structure, function and evolution of CpG island promoters. Cell. Mol. Life Sci. 60, 1647-1658. Barallon, R., Bauer, S. R., Butler, J., Capes-Davis, A., Dirks, W. G., Elmore, E., Furtado, M., Kline, M. C., Kohara, A., Los, G. V., MacLeod, R. A., Masters, J. R., Nardone, M., Nardone, R. M., Nims, R. W., Price, P. J., Reid, Y. A., Shewale, J., Sykes, G., Steuer, A. F., Storts, D. R., Thomson, J., Taraporewala, Z., Alston-Roberts, C., and Kerrigan, L. (2010). Recommendation of short tandem repeat profiling for authenticating human cell lines, stem cells, and tissues. In Vitro Cell Dev. Biol. Anim. 46, 727-732. Capes-Davis, A., Theodosopoulos, G., Atkin, I., Drexler, H. G., Kohara, A., MacLeod, R. A., Masters, J. R., Nakamura, Y., Reid, Y. A., Reddel, R. R., and Freshney, R. I. (2010). Check your cultures! A list of cross-contaminated or misidentified cell lines. Int. J. Cancer 127, 1-8. Clark, S. J., Harrison, J., Paul, C. L., and Frommer, M. (1994). High sensitivity mapping of methylated cytosines. Nucleic Acids Res. 22, 2990-2997.
de Caseres, I. I., and Cairus, P. (2007). Methylated DNA sequences for early cancer detection, molecular classification and chemotherapy response prediction. Clin. Transl. Oncol. 9, 429-437. Feng, Q., Hawes, S. E., Stern, J. E., Wiens, L., Lu, H., Dong, Z. M., Jordan, D. C., Kiviat, N. B., and Vesselle, H. (2008). DNA methylation in tumor and matched normal tissues from non-small cell lung cancer patients. Cancer Epidemiol. Biomarkers Prev. 17, 645-654. Frommer, M., McDonald, L. E., Millar, D. S., Collis, C. M., Watt, F., Grigg, G. W., Molloy, P. L., and Paul, C. L. (1992). A genomic sequencing protocol that yields a positive display of 5-methylcytosine residues in individual DNA strands. Proc. Natl. Acad. Sci. USA 89, 1827-1831. Grutzmann, R., Molnar, B., Pilarsky, C., Habermann, J. K., Schlag, P. M., Saeger, H. D., Miehlke, S., Stolz, T., Model, F., Roblick, U. J., Bruch, H.-P., Koch, R., Liebenberg, V., deVos, T., Song, X., Day, R. H., Sledziewski, A. Z., and Lofton-Day, C. (2008). Sensitive Detection of Colorectal Cancer in Peripheral Blood by Septin 9 DNA Methylation Assay. PLoS ONE 3, e3759. Handa, V., and Jeltsch A. (2005). Profound sequence preference of Dnmt3a and Dnmt3b mammalian DNA methyltransferases shape the human epigenome. J. Mol. Biol. 348, 1103-1112. Herman, J. G., Graff, J. R., Myohanen, S., Nellin, B. D., and Baylin, S. B. (1996). Methylation-specific PCR: a novel PCR assay for methylation status of CpG islands. Proc. Natl. Acad. Sci. USA 93, 9821-9826. Hesson, L. B., Cooper, W. N., and Latif, F. (2007). The role of RASSF1A methylation in cancer. Dis. Markers 23, 73-87. Horton, T. M., Jenkins, G., Pati, D., Zhang, L., Dolan, M. E., Ribes-Zamora, A., Bertuch, A. A., Blaney, S. M., Delaney, S. L., Hegde, M., and Berg, S. L. (2009). Poly(ADP-ribose) polymerase inhibitor ABT-888 potentiates the cytotoxic activity of temozolomide in leukemia cells: influence of mismatch repair status and O6-methylguanine-DNA methyltransferase activity. Mol. Cancer Ther. 8, 2232-2242. Huang, A. M., Montagna, C., Sharan, S., Ni, Y., Ried, T., and Sterneck, E. (2004). Loss of CCAAT/enhancer binding protein delta promotes chromosomal instability. Oncogene 23, 1549-1557. Issa, J.-P. (2004). CpG island methylator phenotype in cancer. Nat. Rev. Cancer 4, 988-993. Karpova, M. B., Schoumans, J., Ernberg, I., Henter, J.-I., Nordenskjold, M., and Fadeel, B. (2005). Raji revisited: cytogenetics of the original Burkitt's lymphoma cell line. Leukemia 19, 159-161. Kawasaki, T., Nosho, K., Ohnishi, M., Suemoto, Y., Kirkner, G. J., Fuchs, C. S., and Ogino, S. (2007). IGFBP3 promoter methylation in colorectal cancer: relationship with microsatellite instability, CG island methylator phenotype, and p53. Neoplasia 9, 1091-1098. Kim, S., Li, M., Paik, H., Nephew, K., Shi, H., Kramer, R., Xu, D., and Huang, T.-H. (2008). Predicting DNA methylation susceptibility using CpG flanking sequences. Pac. Symp. Biocomput. 13, 315-326. Kristensen, L. S., Mikeska, T., Krypuy, M., and Dobrovic, A. (2008). Sensitive Melting Analysis after Real Time-Methylation Specific PCR (SMART-MSP): high-throughput and probe-free quantitative DNA methylation detection. Nucleic Acids Res. 36, e42. Miyake, H., Pollak, M., and Gleave, M. E. (2000). Castration-induced up-regulation of insulin-like growth factor binding protein-5 potentiates insulin-like growth factor-I activity and accelerates progression to androgen independence in prostate cancer models. Cancer Res. 60, 3058-3064. Nardone, R. M. (2007). Eradication of cross-contaminated cell lines: a call for action. Cell Biol. Toxicol. 23, 367-372. Peters, I., Rehmet, K., Wilke, N., Kuczyk, M. A., Hennenlotter, J., Eilers, T., Machtens, S., Jonas, U., and Serth, J. (2007). RASSF1A promoter methylation and expression analysis in normal and neoplastic kidney indicates a role in early tumorigenesis. Mol. Cancer 6, 49. Sambrook, J., and Russell, D. (2001). Molecular cloning: A laboratory manual. 3rd ed. New York: Cold Spring Harbor Laboratory Press. Stacey, G. N. (2000). Cell contamination leads to inaccurate data: we must take action now. Nature 403, 356. Strefford, J. C., Foot, N. J., Chaplin, T., Neat, M. J., Oliver, R. T. D., Young, B. D., and Jones, L. K. (2001). The characterisation of the lymphoma cell line U937, using comparative genomic hybridisation and multi-plex FISH. Cytogenet. Cell Genet. 94, 9-14. Torng, P. L., Lin, C. W., Chan, M. W., Yang, H. W., Huang, S. C., and Lin, C. T. (2009). Promoter methylation of IGFBP-3 and p53 expression in ovarian endometrioid carcinoma. Mol. Cancer 8, 120. Wood, R. J., McKelvie, J. C., Maynard-Smith, M. D., and Roach, P. L. (2010). A real-time assay for CpG-specific cytosine-C5 methyltransferase activity. Nucleic Acids Res. 38, e107. Xiong, Z., and Laird, P. W. (1997). COBRA: a sensitive and quantitative DNA methylation assay. Nucleic Acids Res. 25, 2532-2534. Yan, P. S., Shi, H., Rahmatpanah, F., Hsiau, T. H., Hsiau, A. H., Leu, Y. W. Liu, J. C., and Huang, T. H. (2003). Differential distribution of DNA methylation within the RASSF1A CpG island in breast cancer. Cancer Res. 63, 6178-6186.